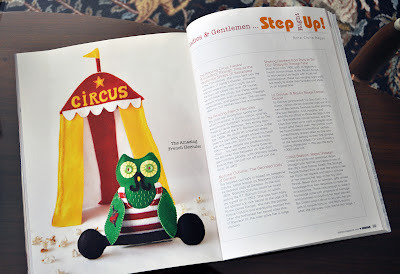 Boston Handmade: Get your Plush On, Stuffed magazine is out! 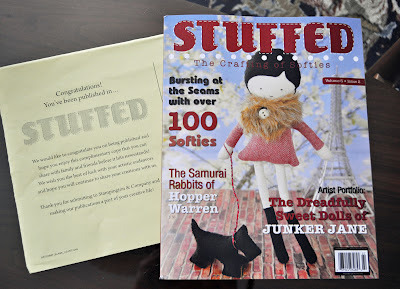 Get your Plush On, Stuffed magazine is out! 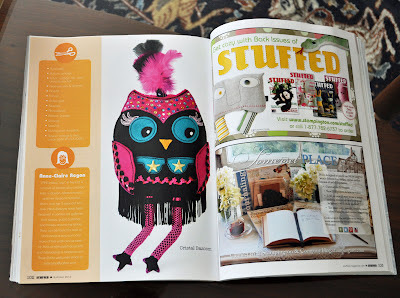 The new issue of "Stuffed - The Crafting of Softies" magazine came out on July 1st online and in bookstores. "Have any of you ever felt like there is a general misconception regarding the world of stuffed dolls?" I found myself saying out loud: "Yep, spot on! 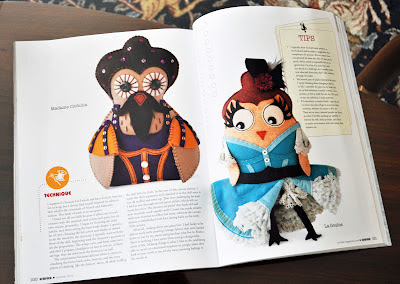 I feel often misunderstood as a plush maker..." (Ok I may not have said it in such a politically correct way!). But now (even if I know you will run to get your own copy soon ;) I feel compelled to give you the whole first two paragraphs so you can understand what I'm talking about. "Have any of you ever felt like there is a general misconception regarding the world of stuffed dolls? It seems as though many people view plush art as mere toys; or, they admire and appreciate the dolls, but regard them as pure fun, no substance. What these people are missing is that, like all art, stuffed creations have meaning, oftentimes a message, and always a purpose. As a plush artist I find it very nice to have this issue brought up to light as it is a sensitive one... No one likes to have its creations looked down upon and regarded as frivolous and useless when it was all created out of love and passion. It's always nice to know that someone understands what we are doing as plush artists, and to be given such a great homage is truly heart warming so for that, Amber, I thank you! .... Do you feel teary already? Ok then, enough with the grand sentiments and on to a few pictures! Find out more about these plush and many more by getting your copy of Stuffed (Summer 2012 Volume 5 Issue 2) either online on the Stampington website or in your local bookstore. If you wish to see more detail pictures of these dolls, you can go to my flickr page and see my portfolio.